This written history has been taken from Ramey AFB’s original website. This page has excellent historical detail about the Base. The material is a written treasure shared by writer, Dennis Smith. 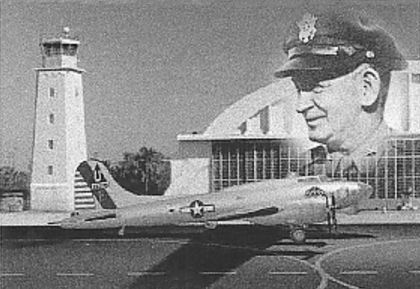 The necessity for an air base in Puerto Rico was recognized and advocated by certain U.S. Army Air Corps officials as a logical extension of the air defense of the Panama Canal, and in 1936 the Commandant of the Air Corps Tactical School forwarded to the Chief of the Air Corps the results of studies and discussions by members of the school’s faculty, pointing out that Puerto Rico was a “most valuable asset” of the U.S. for national defense, and recommending that an air base be established on the island. Puerto Rico was then administratively part of the Army’s Second Corps area, headquartered at Governor’s Island, New York. In July 1938 the area commander, Major Gen. Frank R. McCoy, summarized the logistics connected with Puerto Rican defense and outlined a plan for War Department consideration. He suggested that a suitable air base and auxiliary landing fields be constructed on the island, but that the Air Corps be limited to minimum strength required for maintenance, with a provision to send combat units to Puerto Rico, if and when, the situation demanded. Early in November 1938, the Air Corps was advised by the War Department that a landing field in Puerto Rico was regarded as strictly a wartime need. In December, the Air Corps recommended that sites for such units in Puerto Rico be selected by a qualified board of officers. Early intentions of Nazi Germany had become clear by this date, and planning programs seemed to escalate accordingly. In January 1939, Major George C. Kenny was sent to Puerto Rico to conduct a preliminary survey of possible air base sites, and by February, the Chief of the Air Corps had received Kenny’s report. In all, 42 sites were examined, and Major Kenny declared that Punta Borinquen was the best site for a major air base. Results were submitted to the War Department, and that agency, in early March, informed the Second Corps Area Commander that the Department was contemplating the establishment of an air base in Puerto Rico. The Corps Area appointed a board of officers (Col. Hugo E. Pitz, Lt. Col. Joseph T. McNarney, Maj. George C. Kenny, and Major Karl S. Axtater), and in late March, these men flew to Puerto Rico to conduct a thorough survey. By 15 April, the board completed its work and decided that Major Kenny’s earlier findings were satisfactory. 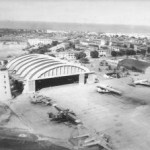 The site for the major air base was to be Punta Borinquen. This site was located at 18 degrees 30′ N – 67 degrees 8′ W, on the northwest comer of the island, 212 feet above sea level. It was some 60 miles west of San Juan and six miles north of Aguadilla, the nearest settlement. The Punta Borinquen lighthouse was on the site. In July, the War Department Adjutant General’s office issued a directive to the Quartermaster General in regard to the proposed field, and work was begun to acquire title to the needed land. By the first week of September 1939, some 3,796 acres covered by sugar cane, had been purchased at a cost of $1,215,000. And, as Hitler’s Panzer divisions raced across Poland, men and equipment began to arrive at Punta Borinquen. By mid-September the first troops arriving at what quickly became known as the cane patch, were personnel of the 1st platoon, Company B, 65th Infantry, under 1 st Lt. Broochart, aided by 1st Sgt. Antonio Montes. These Puerto Rican troops had been dispatched from Henry Barracks in Cayey. They pitched their tents on what was later to become Aircraft Hangar #5. Several weeks later, the remainder of Company B arrived at the site, and by 15 October, construction work had begun on administrative buildings, housing and a hospital. Just two weeks later, on 2 November, Major Karl S. Axtater assumed command of what was to become Borinquen Field. In a somewhat less than auspicious arrival, Axtater, upon landing the first aircraft ever at Borinquen’s crude and unprepared runway, blew the tire on his plane’s tail wheel, but no serious damage or injury resulted. In mid-November, the ground echelon of the very first Air Corps unit to be stationed at Borinquen Field, the 27th Reconnaissance Squadron, arrived at the field under Squadron Commander Major Delmar Dunton. The six officers and 160 enlisted men had departed Langley Field, Va., on November 17, 1939, aboard the USAT Chateau-Thierry, and disembarked with several tons of equipment at San Juan early on the 21st. They immediately proceeded to Borinquen by train. Maj. Dunton returned to Langley Field at once, leaving the ground echelon under the command of 1st Lt. Charles W. Alverson. From November 27th through December 5th, the 27th Squadron’s air echelon, consisting of nine B-18A aircraft, eighteen officers and 28 enlisted men, flew in from Virginia’s Langley field under the command of Major Dunton. The first B-18, with both powerful engines roaring, landed at Borinquen Field on the 27th of November. Its pilot, Capt. Ivan M. Palmer, could not help but notice the large, applauding crowd that had gathered near the runway as they landed. By December 5th, all eighteen bombers, with stops made at Miami, Fl., and Camaquay, Cuba, had arrived safely and Puerto Rico had witnessed the start of its own air age. Several trainloads of supplies and equipment had arrived on a regular basis at the new airfield as construction progressed with a new urgency under the scrutiny of Base Commander Axtater. He estimated correctly, a cost of more than a half million dollars for each hangar to be built to withstand both hurricanes and earthquakes. He, however, never conceived the rapid buildup through the war years that would quickly escalate total costs for base construction to $ 51,000,000 by 1945. But he committed himself to build the best~ the very best airfield facility ever – and he did! By January of 1940, the original plot plan for the field had been approved by the Army Air Corps, and on March 7th, the first detachment of Base Headquarters and the 24th Air Base Squadron from Kelly Field near San Antonio, Texas, had arrived at Borinquen. One month later, Lt. Col. Karl Connell (24th ASG) assumed command at Borinquen. The second detachment of Base Hdqs and the 24th Air Base Squadron arrived at Borinquen from Kelly Field on July 29, 1940, and would soon become known as the 24th Air Base Group. The actual redesignation came about a month later, on September lst, and thus was born Hq and Hq Squadron, 24th Air Base Group. In early November, Borinquen’s strength increased rapidly as new units arrived. The 13th Composite Wing, commanded by Brig. Gen. Follett Bradley, arrived from Langley Field. The 25th Bombardment Group, with its 10th, 12th and 35th Bombardment Squadrons, arrived from Langley. The 27th Reconnaissance Squadron, already at the field, was attached to the 25th Group for control purposes. The balance of the 24th Air Base Group, with its 23rd Air Base Squadron, 33rd Materiel Squadron, and 34th Materiel Squadron, arrived at the same time from Kelly Field. On November 3rd, the air echelon of the 25th Bombardment Group, 14 B-18A aircraft, 2 A-17 aircraft, 32 officers and 44 enlisted men, all arrived at the base from Langley Field. Additionally, we note that construction by this time, had progressed rapidly from October 1939, with much work done on aircraft hangars, runways, barracks, base hospital, officer, NCO and enlisted quarters, instrument repair building, photo laboratory, administrative buildings, post exchange, school house, etc. Work was underway on permanent facilities including an athletic and recreational building, swimming pool, golf course, water filtration plant, power plant, laundry, commissary, service club, officers club, and other needed and desirable facilities. Suffice to say that during its entire existence, the base has undergone almost continuous construction, at some times more extensive than at others. A review of pertinent documents has revealed some damage due to fires and some due to storms, but no really major damage except for one hurricane. Throughout 1941, changes in base forces occurred rapidly. The 13th Composite Wing moved to San Juan in January (reason unknown). On April lst, the 25th Bombardment Group and its units were split down the middle to form the 40th Bombardment Group and the 29th, 44th, and 45th Bombardment Squadrons and 5th Reconnaissance Squadron. And then, on the 25th of April, the 13th Composite Wing returned to Borinquen Field. Borinquen Field came under the jurisdiction of Caribbean Air Force on May 1st, and the Hq, Caribbean Interceptor Command, was established at the base. In a major move, on September 18th, the VI Bomber Command, established elsewhere, assumed control over the 25th and 40th Bombardment Groups and the 5th and 27th Reconnaissance Squadrons. On October 25th, the 13th Composite Wing was inactivated, its personnel being absorbed by the new Hq & Hq Sq, VI Interceptor Command, established at the same time to replace the Caribbean Interceptor Command, also discontinued. 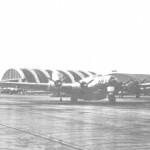 By October 30th, the 35th Bomb Squadron (25th Bomb Group) moved to another base, while, two weeks later, on November 12th, the 12th Bomb Squadron (25th Bomb Gp) also moved to another base. On December 7th, 1941, the Japanese attacked Pearl Harbor, Hawaii, and Borinquen Field went on immediate war alert. Almost immediately, all dependent women and children were ordered evacuated to the U.S. and this was accomplished completely by December 13th. The base school house was converted to a quickly arranged base headquarters. [Ed Note: Dennis C. Smith authored some of the history of Ramey AFB in his book published in 1995 titled, “Antilles,” published by Vantage Press. We found it interesting and rewarding as he wrote about his USAF service time at Ramey during the Korean War in the Air Rescue Squadron from 1951 to January 5th, 1955. Then, from 1959 until his retirement in 1994, Dennis was employed in Puerto Rico by the Section Six military dependent schools run by the U.S. Department of Defense. All the construction and activity had significant impact on the surrounding communities, especially Aguadilla. Cash was flowing and business flourished. Puerto Rico had suffered severely from the depression and greatly needed some relief, but although a new excitement was captivating the district, the undesirable elements that always accompany money were indirectly infused into the district. The pace of life was affected, and transformation of cultural patterns accelerated. Cultural patterns usually change slowly, but the acceleration that started in World War II is now more than fifty years into its cycle with no turning point in sight. The Puerto Ricans in the area became more Americanized than in remote locations, and the aftereffects are still apparent in towns like Aguadilla, Aguada, Moca and Isabela. The military and Puerto Ricans from the surrounding communities generally had good formal relations, but the undercurrent of resentment in many aspects of the relationship was always just below the surface. The Ugly American attitude was far more prevalent in those days than today, and almost all Puerto Ricans have stories of abusive treatment or gross discrimination. They were often treated like second class citizens in their own homeland. In fact, many Americans stationed in the area didn’t even realize that their fellow Americans were even American citizens. They expected the Puerto Ricans to treat them as if they were their great benefactors, rather than fellow American citizens. By January 1, 1942, many of the temporary facilities first constructed at the field had been replaced by permanent facilities. Troops had arrived in large numbers for base operations and tactical units. The principal activities of the field consisted of antisubmarine patrolling by tactical units located on the base and under control of the various headquarters on and off the base. The servicing and maintenance of transient aircraft traffic, both planes and personnel, were rapidly becoming a major task, although much of this was handled by the Puerto Rico Air Depot at San Juan. Antiaircraft guns were situated on and around the base, and their crews manned them on a 24 hour basis. The base carefully observed blackout conditions at night and practice alerts were held frequently. Aircraft were dispersed as much as possible, and much of the airfield was camouflaged. The large guns that were in place on the cliff functioned as part of the coast artillery and were [positioned] to destroy enemy submarines and protect against an invasion force. Little was known about the Japanese global strategy early in the war. If the Japanese got into the Caribbean, the guns were ready. The guns were also prepared to fire on any hostile ships that might pass through the Mona passage to attack the Panama Canal or our shipping. Some of the old Panama gun mounts can still be identified and appear archaic, but in 1942, they were state-of-the-art sophistication. The men manning them thought their mission was important but were able to ride out the war without ever seeing a hostile ship or an enemy aircraft of even having to fire upon a real enemy target. Throughout World War II, various bombardment squadrons were stationed at Borinquen at one time or another, but the primary mission of Borinquen Field gradually became as a landing field, refueling station and aircraft service depot for American aircraft of all types flying to the European and African war theaters. The planes generally flew nonstop from Florida or the Eastern seaboard of the mainland United States, a distance that varied from twelve hundred miles from Miami to sixteen hundred miles from New York City. Depending on circumstances, they also had the option of stopping in Cuba or one of the other islands. After refueling and servicing at Borinquen, or even staying over for a period of time, the flight crews could continue on to Trinidad or fly directly to Belem or Recife, Brazil. They could then fly to the South Atlantic at its shortest distance, which was about two thousand miles, to Dakar in Africa, a distance that was well within the range of most military aircraft of World War II. Once in Africa they could easily hop up to either the African war theater or the European war theater. On the return trip, they reversed the procedure. This route was especially attractive in the winter, when the weather was notoriously bad in the North Atlantic. The service that Borinquen and Puerto Rico provided to the war effort in this capacity helped the Allied powers significantly in establishing the air power superiority that led to victory over Germany in World War II. Changes occurred rapidly. The 27th Reconnaissance Squadron was officially assigned to the 25th Bombardment Group on March 3rd. On March 6th, the Caribbean Air Force was redesignated the Sixth Air Force and it kept jurisdiction over Borinquen Field. Lt. Col. Jasper N. Ball and Capt. Homer B. Hopkins arrived at the base on April 7th to establish an Air Transport Command ferrying squadron, for which enlisted men were drawn from various base organizations. On the 22nd of April, the 5th and 27th Reconnaissance Squadrons were redesignated the 395th and 417th Bombardment Squadrons, respectively. From June of 1942 until December 1, 1943, AAF Detachment, 20th Troop Carrier Squadron operated from Borinquen Field to provide theater air courier service. And on June 4th, the VI Interceptor Command was redesignated VI Fighter Command. Its headquarters remained at Borinquen Field. By June 6, 1942, the 25th Air Depot Group had arrived at the base from Brookley Field, Ala. Its mission was to maintain and repair aircraft for the entire Antilles region, including transient aircraft. This was one day before the 40th Bombardment Group, with its 29th, 44th, 45th and 395th Bombardment Squadrons left the base for operations elsewhere. On Sept. 21st, the 417th Bombardment Squadron (25th Bomb Gp) moved to another base and on October 31st, the 25th Bombardment Group and 10th Bombardment Squadron also moved to another base for operations. 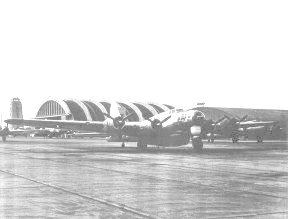 Earlier, on October 17th, Flight D, 12th Bombardment Squadron (25th Bomb Gp) arrived at Borinquen Field for duty. The 64th Ferrying Squadron was activated at the base on November 6th, replacing the existing 23rd Ferrying Squadron. The new unit absorbed the personnel of the old one, as well as excess personnel of the 25th Bombardment Group. Throughout 1943, transient aircraft and passengers through Borinquen Field, going to combat theaters (or returning from such theaters to the U S.) constituted a heavy work load at the base. During this year there were 5,291 tactical aircraft and 4,836 cargo/passenger aircraft processed, carrying 51,274 officers, 34,891 enlisted men, and 6,325 civilians. Many of the aircraft remained overnight at the base, so the crews and passengers had to be fed and billeted. That averaged almost thirty aircraft per day, with nearly 250 crew members and passengers. Traffic throughout the year was not evenly distributed, as most of the traffic was in the winter and the daily numbers were much higher at that time. That strained the Borinquen facilities beyond their maximum, as did other irregularities. Occasionally, repairs had to be made and the crews and passengers stayed on for extended periods of time before departing. The southern route from the U.S. to Europe via the Caribbean, South America and Africa, had its heaviest load in the winter months when the more northerly route was lightly used. The 25th Air Depot Group repaired or serviced 1,982 aircraft during the year. This depot, by the close of 1943, employed 6,247 officers, enlisted men, and civilians. 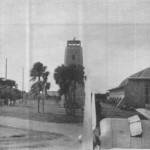 During most of 1943, the base was a training center for coast artillery firing. Many Puerto Rican troops trained at Borinquen before going elsewhere on the island for duty. Some base activities during this period included the development of a “quarantine trailer” system whereby incoming aircraft were met by a special mobile medical examination trailer, so doctors could examine passengers on the spot for communicable diseases; operation of a “liner diner”, with 24 hour lunchroom service on the flight lire; implementation of an extensive base bus system; the cultivation of a large number of acres of land to raise fresh vegetables; and erection of a monument at the base cemetery to honor war dead. Construction included the completion of a 150 bed hospital; opening of the athletic and recreation building (complete with indoor basketball, tennis, and badminton courts, boxing ring, and theater), new picnic grounds and many necessary base buildings, warehouses, and utilities systems. By March 20th, the VI Fighter Command had moved to another base and on May 27th, the Antilles Air Task Force was assigned jurisdiction over the base. Later, in June, the 24th Service Group and the 33rd Service Squadron moved to another base. The Antilles Air Task Force was redesignated Antilles Air Command on June 1, 1943. On September 12th, the 417th Bombardment Squadron (formerly 27th Reconnaissance Sq) returned to Borinquen Field and on October 1, Station #5, Caribbean Wing, ATC, replaced the 64th Ferrying Squadron as the Air Transport Command Unit at the base. Hq 25th Bombardment Group returned to the base on Oct 5th. On October 10th, the 23rd Base Headquarters and Air Base Squadron disbanded; at the same time, Hq & Hq Sq, 348th service (later, Air Service) Group was formed, and took over operation of the base. Its subordinate units were: 34th Service (later, Air Service) Squadron, 548th Service (later, Air Service) Squadron, and 554th Service (later, Air Service) Squadron. On the 27th of October, the 4th Tactical Reconnaissance Squadron moved to the base and on November 16th, the 25th Air Depot Group departed for the U.S. A reduced-size depot operation was taken over by the 55th Service Squadron of the 348th Service Group, just a day after the 63rd Service (later, Air Service) Squadron arrived at the base, joining the 348th Service Group. On December 1st, a troop carrier detachment, Antilles Air Command, was assigned to provide air courier service throughout the Caribbean, operating from Borinquen Field, continuing until July 10, 1944. McAvoy, Thomas. “To India and back in 10 days.” LIFE 5 June, 1944: 91-99. Caption reads: “Borinquen Field, Puerto Rico, May 5, 1944 lunch and tanks refilled. A C87, “Fire Ball Express”, (converted B24) with the control tower in the background.”. During 1944, the primary mission of Borinquen continued to be the servicing of aircraft that were going to and returning from the war theaters. They again serviced over ten thousand aircraft and more than a hundred thousand crew members and passengers. By this time, base operations were more streamlined, but the aircraft were returning from the war theaters were in much poorer condition than during the previous year, and many needed extensive repairs before being ready for the long flights to their destinations. Construction at Borinquen continued throughout the war, and in February of 1944 they were ready for the first B-29 to land at Borinquen. The first B-29, piloted by Capt. W. A. Stewart, landed on Leap Year Day, February 29, 1944, and although Capt. Stewart was probably unaware at the time, his was the first of a sequence of B-29s, B-50s, B-36s and B-52s that would be home-based at Borinquen for a period of almost twenty years. By December of 1944, the Army Air Corps was planning an extensive B-17 and B-29 training program at Borinquen; shortly after, several B-29s arrived and started the training program. They practiced long range over-water navigation and bomb runs with P-39s from the Fourth Tactical Reconnaissance Squadron flying practice intercepts on the bombers. Puerto Rico and Borinquen were ideally situated for the type of flights that the B-29s would have to make in the Pacific. The flights from Puerto Rico would involve training for taking off from an island in the Pacific, followed by long over-water flights to mainland Japan, and then the encounter with Japanese fighter aircraft, and the long return of the flight home. From July 10, 1944 to October 15, 1946, the 330th Transport Squadron (Cargo and Mail), which replaced the Troop Carrier Detachment, Antilles Air Command, carried out air courier functions, operating from Borinquen Field. And on August 1, 1944, Hq & Hq Sq, Antilles Air Command was located at Borinquen Field and most base units fell under this command’s control. On September 13, 1944, Base Theater No. 1 (800 seat capacity) opened for business. By December of 1944, base strength, 48th Air Service Group and its base operating units (but not including depot and miscellaneous units such as ATC and Second Air Force) numbered 214 officers and 1,768 enlisted men. On December 1, Col. William A. Miller of the Second Air Force arrived to establish the Second Air Force Command Post #1 at Borinquen Field. This CP was to supervise an extensive B-17 and B-29 training program in the Caribbean area prior to the deployment of the units to the Far East. The command post was manned by personnel from the 242nd AAF Base Unit, 6th Bombardment Group, and 502nd Bombardment Group. On December 3rd, several B-29s arrived at Borinquen Field to start the Second Air Force training program. Each squadron of the 6th and 502nd Bomb Groups was to rotate for this training, one squadron at a time. P-39s of the 4th Tactical reconnaissance Squadron were used to provide practice intercepts of the bombers. On December 22nd, the Second Air Force Command Post #1 was discontinued and replaced by 205th AAF Base Unit, VH (Special), known officially as the “Gypsy Task Force” of Second Air Force. Col. William A. Miller assumed command. Several hundred Second Air Force personnel were involved in the B- 17 and B-29 training program. Through the first part of January, B-29s of Gypsy Task Force increased from 7 on January 1, to 39 by January 18. 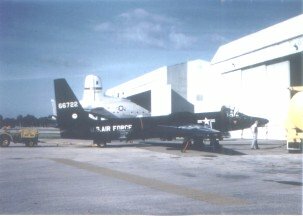 The Second Air Force also deployed 12 P-63 fighters to Borinquen Field to provide interceptor training for the bomber crews. About 2,000 personnel were involved, but not all at Borinquen Field. On February 1st, the 205th AAFBU, “Gypsy Task Force,” left Borinquen. Detachment C, 290th AAF Base Unit (Sub-Task Force 3, Gypsy Task Force) was established at Borinquen Field under Lt. Col. William C. Bryson, to continue B-29 training with 26 aircraft. By May of 1945, Borinquen Field began gearing itself to support the Green Project, the massive airlift of combat troops from Europe to the U.S., and the White Project, the return of combat aircraft from Europe to the U.S.
On May 16th, Gypsy Task Force ended all operations at Borinquen Field, as the base prepared for the Green and White projects and on the 20th, the 4th Tactical Reconnaissance Squadron moved form the base, to ease expected runway congestion. On August 20,1945, Hq & Hq Sq, Antilles Air Command, moved from Borinquen and on October 5th, the 4th Tactical Reconnaissance Squadron returned to Borinquen. From November 13th until mid-January 1945, Detachment, 243rd AAF Base Unit (of Second Air Force), with 24 officers, 26 enlisted men, and 4 B-29 aircraft, operated from the base while performing radar scope photography of all islands between Miami and Trinidad. Note: With the end of the Green and White Projects, and the end of World War II, Borinquen Field underwent a rapid demobilization, losing over 2,000 personnel with many more to follow. At the same time, plans to continue the base were apparent in new construction: swimming pools for the Officers and NCO Clubs, a dry cleaning plant, new sewer lines, new finance building, base restaurant, beer garden, and other facilities. Camouflage markings were removed from the base and repainting of the buildings was begun. In January of 1946, new construction, indicating a long-time base continuance, included extension of runways and a 500,000-gallon water storage tank. On January 2nd, the 4th Tactical Reconnaissance Squadron was reduced to “paper” unit status, with aircraft placed in storage and its remaining personnel transferred to 330th Transport Squadron. In February, new runway lights were installed and on March 1st, Hq and HqSq, Antilles Air Command, returned to the base. The 350th Base Hospital Detachment, 501st MP Detachment and the 75th QM Company (Bakery) remained in place. Other units at Borinquen, not under Antilles Department or Caribbean Air Command control, were the 155th AACS Squadron (785th AAFBU), the 9th Weather Squadron and the 1103-5, ATC. On August 1, 1946, Hq Antilles Composite Wing assumed control over Borinquen Field, and three days later, an earthquake shook up the base, but caused no serious damage. The 4th Tactical Reconnaissance Squadron, still a “paper” unit, departed Borinquen on August 19, 1946.On the 24th, base headquarters moved out of the elementary school building it had occupied for several years, and into Barracks #12, so the former school building could return to its original purpose. The next day, Hq & Hq Sq, Antilles Composite Wing, was inactivated and replaced by Hq & Hq Sq, 24th Composite Wing. On the 10th of September, Air Base and Air Depot Headquarters, Borinquen Field, was re-designated Headquarters, Borinquen Field. On October 15th, the following units were re-designated: Hq & Hq Sq, 48th Air Service Group, was re-designated Hq and Base Service Squadron, 48th Air Service Group; the 34th air Service Squadron was re-designated the 34th Air Engineering Squadron; and the 63d Air Service Squadron was re-designated the 63d Air Materiel Squadron. The 334th Troop Carrier Squadron, operating from Borinquen Field (later Ramey AFB) transported 12,202 passengers and 13,755,666 pounds of cargo between October 15, 1946 and August 1, 1948. 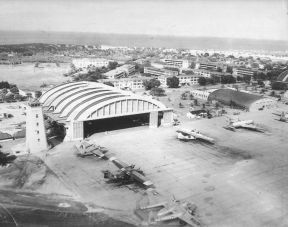 On October 31st, 1946, Borinquen Field was re-designated Borinquen Army Air Field, and in November, Borinquen Army Air Field was designated as the airport of entry for all aircraft of the 24th Composite Wing, which controlled (in addition to this base) Atkinson, Beane, Coolidge, Vernam and Waller Fields in the Antilles Region. In early January of 1947, assignment of the 330th Station Hospital from the Antilles Department to the Caribbean Air Command completed the change from U.S. Army to Army Air Forces jurisdiction of all organizations at the base. Later, during February and March, the 36th Fighter Group was deployed at Borinquen Army Air Field from Howard Field, Canal Zone, for participation in naval maneuvers in the Puerto Rico area. On April 1st, the 330th Station Hospital was transferred back to the Antilles Department, but remained active at Borinquen to support the AAF units. In preparation for its eventual closure, the 48th Air Services Group established an unnumbered base dispensary. Sky masters of the 334th Troop Carrier Squadron, Borinquen, on July 17, 1947, completed one of their largest post-war air operations by moving an entire battalion of the 65th Infantry from Waller Field, Trinidad, to Isla Grande, San Juan, Puerto Rico, in a single day. On December 15th, the base’s name changed back to Borinquen Field. The Air force had separated from the Army in September and the “Army” part of the base name no longer applied. At the end of 1947, a relatively quiet year, there were some small unit changes with the addition of an Air Reserve Training Detachment and the 18th Army Postal Unit. 18 September, 1948. Mrs. Howard K. Ramey, assisted by Col R. A. Breitweiser, unveils the plaque. Brig Gen John A. Samford, and Col Salvador Roig. In February, several new buildings were completed at the base, and base organizations began moving into them. Action was begun to dispose of many temporary buildings, and Mr. W. Stuart Symington, Secretary of the Air Force, visited the base and inspected facilities and organizations. Other base units were reassigned, either to the new air division or the new wing. The Hq, 5901st Maintenance and Supply Group, and Hq & Hq Sq, 5904th Air Base Group, were not manned except by one officer and one airman, for record purposes. Colonel Robert A, Breitweiser, who had commanded the 48th Air Service Group and the base, assumed command of the 5900th Wing and remained as base commander. 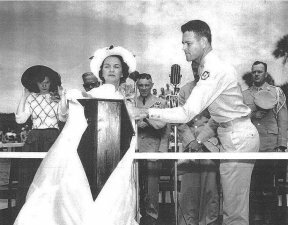 In August of 1948, the 198th Fighter Squadron, Puerto Rico ANG, conducted summer field training at Ramey AFB, and in September Mrs. Howard K. Ramey, widow of the officer for whom Ramey AFB was named, participated in an official dedication ceremony at the base with Col. Breitweiser. In September of 1948, 5900th Wing was re-designated 5900th Composite Wing. At the same time, the air base group and the maintenance and supply group were manned, and the following units were discontinued: 5905th Finance Disbursing Unit, the 5906th Communications Squadron, the 5907th Air Police Squadron, and the 5908th Food Service Squadron. The 343d Strategic Reconnaissance Squadron was deployed at Ramey AFB from 5 January to 31 March, with 35 officers and 125 airmen, to carry out photographic reconnaissance work in the Caribbean area. Also in January and February, the 5911th Medical Dispensary was re-designated as the 5911th Station Medical Group; the 330th Station Hospital transferred all of its personnel to the 5911th Station medical Group, and the 330th then became non-operational. It was later moved from the base. At the same time, the following units were assigned to the 5900th Composite Wing, 12th Signal Radio Maintenance Team, Aviation; the 776th Air force Band and the 5505th Air National Guard Unit. In May, Ramey AFB was transferred from the Caribbean Air Command to the Strategic Air Command, and came under jurisdiction of Second Air Force, SAC. All base organizations were included in the transfer. On June 25th, communist North Korea, armed by Russia, crossed the 38th parallel, as more than 60,000 ROK troops invaded South Korea. The great majority of airmen at Ramey, as at other USAF bases, immediately saw their enlistments extended for an additional calendar year. More than 1,285,000 airmen, some from Ramey, went on to see service in Korea, where battle deaths climbed to more than 55,000. In August, the 5505th Air National Guard Unit was discontinued, but replaced by the 4216th Air National Guard Unit. On the first day of November, the 5900th Composite wing and all assigned units except the 14th Air Postal Unit were discontinued. At the same time, the Hq & Hq Sq, 55th Strategic Reconnaissance Wing, Medium, was established as the principal operator of the base. The character of the base changed at this time from that of a support facility for transient aircraft traffic, to that of an operational base supporting an active program of strategic reconnaissance, charting photography, electronic geodetic mapping and surveying, and related reconnaissance functions for the Strategic Air Command. Col. Richard T. King, former commander of the 5900th Composite Wing, and Ramey AFB, assumed command of the 55th Wing. Tactical and technical units of the new wing at this time were attached to the 91st Strategic Reconnaissance Wing at Barksdale AFB, LA., but were soon to join the parent wing at Ramey AFB. On December 13th, elements of the lst Computations Technical Squadron began arriving at Ramey, and nine days later, the first RB-50s began arriving for assignment to the 338th Strategic Reconnaissance Squadron. In early January, HIRAN (AN/APN-2A) equipment began being used by the Wing for precise geodetic aerial surveying, but older SHORAN equipment was still being used in many places. The wing drafted specifications for trilateration mapping work needed for the Long Range Proving Ground guided missile range. New construction at the base included improvements and resurfacing of runways, taxi ways and aprons, a compass swinging rose, and other improvements to better meet the needs of wing WB-50 and KB-29 aircraft. On January 4th, elements of the 343d Strategic Reconnaissance Squadron began arriving with RB-29s and immediate action was taken to convert the unit to RB-50s. Two days later, elements of the 38th Strategic Reconnaissance Squadron began arriving at Ramey AFB from Barksdale AFB. On January 8th, air crews and ground support personnel for the 55th Air Refueling Squadron began arriving, joining the advance echelon already in place. From January 15th to May 17th, the 38th Strategic Reconnaissance Squadron was deployed at Bassingbourne RAF Station, England. All of the 55th Wing’s tactical units, and later, of the 72d Wing, were frequently deployed away from Ramey AFB. As a matter of fact, a reorganization of the 55th Wing on February lst resulted in the commander of the 55th Air Base Group becoming the base commander. Previously, the senior officer had usually been the base commander. On February 10th, a reorganization of the 55th Wing resulted in the inactivation of the following units: the Hq, 55th Maintenance and Supply Group and the 55th Communications Squadron. At the same time, the 55th Strategic Reconnaissance Group was reduced to “paper” unit status and the 55th Medical Group was re-designated a squadron and assigned to the 55th Air Base Group. The 55th Maintenance Squadron, the 4218th Armament Electronics Maintenance Squadron, and the 4218th Organizational Maintenance Squadron were assigned to the wing headquarters, under the Director of Materiel. The 55th Supply Squadron and 55th Motor Vehicle Squadron were assigned to the 55th Air Base Group. Finally, a new unit, the 4218th Operations Squadron, was organized and assigned to the air base group. On March 15th, the 338th Strategic Reconnaissance Squadron began a trilateration survey for the Long Range Proving Ground guided missile range. The Puerto Rican Civil Air Patrol had its summer encampment at Ramey AFB from July 7 – July 21, assisted by the base’s Provisional Training Squadron. In October, a $6 million contract was awarded for the construction of 575 Wherry Housing units at Ramey, and construction began on a new 2-story building to be used as quarters for nurses. In January, construction began on a new $598,000 base school and two weeks later, Ramey’s USAF Hospital was designated as a fixed facility. On February 14, the 55th Medical Squadron was re-designated back to group status, and assigned to the wing. The 55th Maintenance and Supply Group was activated and assumed control over the 55th Maintenance, 4218th Organizational Maintenance, and the 4218th Armament Electronics Maintenance Squadrons. The 55th Communications Squadron was activated and assigned to the 55th Air Base Group. Between February 20th and 23rd, Ramey AFB hosted the SAC Reconnaissance Conference, with representatives from all SAC reconnaissance wings worldwide. The following units were re-designated: The Hq & Hq Sq, 55th SRW, and Hq Hq Sq, 55th ABG, were re-designated the Hq, 55th SRW and the Hq, 55th ABG. The 55th Maintenance Squadron was re-designated the 55th Field Maintenance Squadron; and the 38th Strategic Reconnaissance Squadron, Medium, Photographic, had the word “Photographic” dropped. The following units were activated: the 55th Periodic Maintenance Squadron, the 55th Armament and Electronics Maintenance Squadron, and the 55th Operations Squadron. At the same time, the Hq, 72d Strategic Reconnaissance Wing, Heavy, along with subordinate organizations paralleling those in the 55th Wing, were activated. Most of these units were manned only by one officer and one airman, but the 72d Reconnaissance Technical Squadron absorbed all personnel and equipment of the inactivated 55th Reconnaissance Technical Squadron and thus became fully operational at once, attached to the 55th Wing for control. Later, on September 20, the 55th Air Base Group, with its Operations, Supply, Motor Vehicle, Air Police, Food Service, and Installations Squadrons, and the 55th Medical Group, were reduced to “paper” unit status, and all personnel were absorbed by similarly designated units of the 72d Air Base and 72d Medical Groups. These 72d Wing units were then attached to the 55th Wing for control. A new commander was appointed for the 55th SRW on October 1st, and the former commander, Col. Alfred F. Kalberer,. assumed command of the 72d SRW. Transfer of excess personnel of the 55th Wing to the 72d Wing commenced at this time, bringing the 72d Wing into actual existence for the first time since its arrival at the base. The 55th Wing’s headquarters and units began their movement to Forbes AFB, Kansas. Through October, at staggered intervals, the 55th Wing’s headquarters, maintenance units, tactical units, medical group, and computations squadron moved from Ramey AFB. The 55th AB Group remained, in a “paper” unit status. The 2d Crash-Rescue Boat Flight, 14th Air Postal Unit and 522d Air Force Band, unaffected by the movement, were transferred to the 72d AB Group. Base tenant units were also unaffected by the move, merely transferring their support to the new wing. All excess personnel of the 55th Wing units were used by the 72d Wing units in manning themselves. On October l6th, the 55th AB Group and its Operations, Supply, Motor Vehicle, Air Police, Food Service, and Installations Squadrons were inactivated, and on the 27th, the first two RB-36 aircraft for the 72d SR Wing arrived at Ramey, starting a steady flow of such aircraft to the base. In November, the character of Ramey AFB shifted emphasis from mapping and charting to that of purely strategic reconnaissance operations. Tactical units of the 72d Wing were to operate worldwide to fulfill their tactical missions. From January 7 through January 14th, about 2,000 members of the 296th Regimental Combat Team, U.S. Army, supported by 14 C- 119 aircraft of the 516th Troop Carrier Wing, participated in a simulated combat exercise, Operation Fleetfoot at Ramey AFB. On January 8th, the first RB-36 for the 72nd Strategic Reconnaissance Squadron arrived, starting a flow of aircraft to that unit. The first 20 units of the Wherry Housing project were completed on January 31st, and turned over to the base, and on the 24th and 25th of February, the Second Air Force Commanders’ Conference was conducted at Ramey. In March, five RB-36s arrived for the 301st SRS, starting that unit on the road to full operational status. Again, in June, 341 cadets of the Puerto Rican Civil Air Patrol had their summer encampment at Ramey. The last of the Wherry Housing project units were completed and accepted by the base in September. At the same time, several new airmen’s barracks were also completed and airmen began moving in. The rest of the new barracks were completed in February, and on the 1st through the 5th of March, all Ramey AFB personnel were restricted to the base as a result of a shooting incident in the U.S. House of Representatives by Puerto Rican nationalists. An Airman’s Academy was established by the 72d AB Group to provide training to the lower four enlisted grades, 30 men per class, each class running three weeks, to develop NCO potential. The first class commenced on June 7th. During December, the U.S. Army’s 296th Regimental Combat Team, supported by 27 C-119s of the 456th Troop Carrier Wing from Charleston AFB, S.C., carried out an Operation Fleetfoot training maneuver at Ramey and other points in Puerto Rico. Ramey AFB hosted the USAF Commanders’ Conference January 17-19, with key USAF personnel (from the Secretary of the Air Force Harold E. Talbott on down) in attendance. The conference site was the base Officers’ Open Mess. Conferees were billeted in a new BOQ known as the Ramey Hilton, completed just in time for the meeting. The base provided all logistical support, including two buses and 60 staff cars with drivers. Groundbreaking for a new base chapel and a new NCO Club was held in March, and on March 13th, 20 sentry dogs were added to the base’s security force. Ramey became one of the first SAC bases to employ such dogs for guard duty. On April l5th, the 72d Reconnaissance Technical Squadron was inactivated. The 72d Strategic Reconnaissance Wing, which for several months had been performing bombardment operations in addition to reconnaissance work, shifted over entirely to bombardment operations. In June, news was received that Ramey was approved by the USAF as the site for 420 additional Wherry Housing units, 252 for airmen and 168 for officers. The 198th Fighter-Interceptor Squadron, Puerto Rico ANG, had its summer encampment at Ramey AFB from July 24th through August 7th. Also in August, Ramey’s Airman’s Academy was renamed NCO Preparatory School. On the first day of October, the 72d Strategic Reconnaissance Wing, together with its 60th, 73d, and 301st Strategic Reconnaissance Squadrons, were re-designated as Bombardment units. The wing’s mission, already converted to bombardment, officially changed from reconnaissance to bombardment on a global scale. On the 19th, the Federal Housing Authority authorized construction of 420 Wherry Housing units at Ramey AFB. During October and November, the U.S. Navy’s VP-26 Naval Patrol Squadron, from Brunswick NAS, Maine, spent six weeks at Ramey on antisubmarine warfare training. The unit’s 50 officers and 200 sailors, and 12 P2V Neptunes, were provided full base support. During December, a detachment of F-84Fs of the 466th Strategic Fighter Squadron from Turner AFB, Ga., trained at Ramey AFB, and on the 12th, a groundbreaking ceremony for 420 new Wherry Housing units was held. The $4 million contract went to Fullana Construction Company. The 31st Fighter Wing, Turner AFB, Ga., provided F-84F fighters to train at Ramey with air crews of the 72d Wing from January 9th to the l9th. From the 23rd to the 25th, Ramey AFB hosted the USAF Commanders’ Conference. Secretary of the Air Force Donald A. Quarles headed the distinguished group of conferees. The Officers’ Open Mess was used as the conference site. Ramey units provided all necessary logistical support. From March through May, the 31st Fighter Wing’s 307th, 308th, and 309th Squadrons provided F-84Fs at Ramey to train air crews of the 72d Wing, and from the 3rd to the 9th of March, Ramey AFB hosted a conference of the Secretary of Defense (Charles Wilson) and the Joint Chiefs of Staff, with a large supporting staff. The conference was held at the Officers’ Open Mess. On the last day of March, a new base bank, Banco Popular de Puerto Rico, opened for business in a new building featuring a drive-up window; and again, some 200 cadets of the Puerto Rico Civil Air Patrol had their summer encampment at the base in June. On the 12th of August, Hurricane Betsy struck the base with 115 MPH winds. Most base aircraft had been evacuated well in advance of the storm. There were no fatalities, but there were some injuries and the storm damage came to $153, 000. In August of 1957, two U-2 spy planes were stationed at Ramey AFB (TDY). Rumors circulated that they were “collecting air samples.” Mission time was between 10-14 hours. The Wing Commander’s NCO Advisory Council was established in October. In November, a B-36, on the flight line, had a submersible fuel pump problem and blew up. No one was injured, but massive damage to the aircraft. In January, work was begun to strengthen runways and to otherwise prepare for the arrival of B-52 and KC-135 aircraft at Ramey, and the government purchased and assumed control over the original 575 Wherry Housing units at the base on January 1st. The USAF Commanders’ Conference was again held at the base from January 19th to the 22nd. Secretary of the Air Force J. H. Douglas headed the conferees, and the conference took place in the Officers’ Open Mess. On the first day of February, evangelist Bill Graham drew a crowd of 5,000 to a religious rally he conducted on the base, and on that same day, the government purchased and assumed control of the newer 420 Wherry Housing units. In July, the 72d Bomb Wing began disposing of all RB-36 aircraft in preparation for its conversion to B-52s. The 301st Bomb Squadron was reduced to non-operational status, and on September lst, the 915th Air Refueling Squadron, Heavy, was activated at the base as a unit of the 72d Bomb Wing. The last RB-36 of the 72d Bomb Wing left the base on November 18, and on the 5th of December, the first KC-135 arrived at the base for the 915th Air Refueling Squadron, starting a flow of such tankers to the base. The 72d Bomb Wing and Ramey AFB were transferred from the jurisdiction of the Second Air Force to the Eighth Air Force, SAC, on January lst, and on the 5th, the 73d Bomb Squadron was transferred without personnel or equipment to Seymour-Johnson AFB, N.C.
On the 1st of February, the 4235th USAF Hospital and the 72d Tactical Hospital units were deactivated. The following units were re-designated: the Hq 72d Air Base Group was re-designated the Hq 72d Combat Support Group; the 72d Periodic Maintenance Squadron was re-designated the 72d Organizational Maintenance Squadron; and the 72d Air Police Squadron was re-designated the 72d Combat Defense Squadron. The 826th Medical Group and the 72d Aircraft Support Squadron were activated. On June l7th, the 301st Bomb Squadron transferred without personnel or equipment to Eglin AFB, Fla. From July lst to October 9th, the B-52 equipped 69th Bombardment Squadron, Heavy, operated at Ramey AFB under operational control of the 72d Wing. On August 14th, the first B-52 for the 72d Bombardment Wing arrived at the base. A “G” model, it was christened “La Fortaleza” in honor of the residence of the governor of Puerto Rico, and one of the earliest fortifications erected in San Juan. In October, house to house mail service was instituted for family quarters on the base, and in November, Ramey hosted the Worldwide Civil Engineering Conference, headed by Brig. Gen. A. M. Minton, USAF Director of Civil Engineering. On February 22-23, President Dwight D. Eisenhower and other dignitaries visited the base on their way to South America, and again upon their return in March. On March 8th, the tour of duty at the base, for unaccompanied airmen, was changed from 36 to 24 months. From March 14-28, all base units supported Operation Big Slam/Puerto Pine, the largest peacetime air transport movement of U.S. Army forces up to that time. MATS aircraft airlifted 21,000 troops and 11,000 tons of equipment from several posts in the U. S. to Puerto Rico, and later returned the men and equipment to their home stations. On July 1st, the 21st Aviation Depot Squadron was re-designated the 21st Munitions Maintenance Squadron. On the 4th and 5th of September, Hurricane Donna passed 112 miles north of the base, so except for some rain, there was no problem. When it appeared that this hurricane might approach the base, all B-52s and KC-135s were evacuated to bases in the U.S.
Ramey AFB hosted the USAF Commanders’ Conference from the 11th to the 14th of January. Under Secretary of Defense Thomas H. Douglas, and Secretary of the Air Force Dudley C. Sharp, headed the list of distinguished conferees. From February 19th to the 24th, some 46 Latin American military leaders from 17 nations were at Ramey AFB for Operation Solidarity, a demonstration of U.S. Army, Navy, Air Force and Marine Corps weapons and tactics. General L.L. Lemnitzer, chairman of the JCS, had overall control of the demonstration, the purpose of which was to foster Western Hemisphere understanding. Late model aircraft, and models and mockups of missiles, were on static display. The USAF Thunderbirds performed. On the 20th of March, one of the five base power generators exploded, injuring two personnel. A $2,904,564 project was begun on April 3rd to rehabilitate all 995 of the Wherry Housing units at the base. Another project was begun to replace old street lights, and on 30th, the damaged power generator was returned to service. A second power generator exploded on May 2nd, and all but the one recently returned to service were shut down. The base had to use its single generator for essential facilities, but some electrical power was drawn from civilian sources. Severe conservation of electrical power was necessary. On the 30th of May, two of the power generators were put back into operation, giving the base three units. The power situation eased somewhat, but restrictions continued to be imposed. The 156th Fighter Group (Air Defense), of Puerto Rico, ANG, equipped with F-86H aircraft, held summer encampment at the base from July 30 to Aug 13. Also in August, the remaining power generators were back in operation, and the base power situation returned to normal. Construction was begun on an Instrument Landing System (ILS) facility for the base. On October 1st, control of Ramey’s air terminal was transferred from the 72d Wing to Detachment 2, 1608th Air Transport Wing, MATS. The 72d Aircraft Support Squadron was inactivated and the 72d Operations Squadron was reduced to a “paper” unit. On December 18th, President John F. Kennedy and a party of dignitaries visited the base on their way to South America. Ramey AFB provided extensive support to Tactical Air Command participants during exercise Banyan Tree III from February 19th through March 2nd. Also in March, the ILS facility was placed in operation. The last of the 995 Wherry Housing units was completely renovated, ending this extensive project on July 26th, and the next day, construction commenced on a new elementary school at the base at a cost of $806,000. On October 1st, control of the 72d Bomb Wing passed from the Eighth Air Force to the 823d Air Division, located in Florida and on November lst, the 72d Airborne Missile Maintenance Squadron was activated. From the 6th to the 10th of December, Air Force Reservists of the 9999th Air Reserve Squadron (all of whom were U.S. Congressmen and high-ranking AF Reserve officers) spent five days at Ramey as part of their 15 day active duty tour. The USAF Commanders’ Conference was held at the base from January l7th through the 20th. Air Force Secretary Eugene M. Zuckert headed the distinguished gathering. From the 9th to the 12th of January, the USAF Commanders’ Conference was again held at Ramey AFB. Neil A. Hardin, Assistant Secretary of the Air Force, and Air Marshal C. R. Dunlap, Chief of Staff, Royal Canadian Air Force, were on hand at the conference, in addition to USAF C/S General Curtis E. LeMay and all USAF key commanders. Air Force Logistics Command held its Commanders’ Conference at Ramey January 13-15, presided over by General Mark E. Bradley, Jr. AFLC Commander, and on March 2-4, Lt. Gen. Joseph J. Nazzaro conferred with all of his division, wing and base commanders. Some 25 members of the U.S. Congress made an orientation visit to Ramey AFB from March 30 through April 2. The USAF Commanders’ Conference was held at Ramey from January 7- 10. Assistant Secretary of the Air Force Robert H. Charles, and Air Marshal C. R. Dunlap, C/S, RCAF, were in attendance with all senior USAF commanders. On April 1st, Detachment 2, 53d Weather Reconnaissance Squadron, was organized at the base, using WC- 130 aircraft for hurricane and other specialized weather reconnaissance. The detachment was to be joined later by the parent squadron, withWB-47 aircraft. From April 29th to June 30th, Ramey AFB units supported extensive U.S. Army and U.S. Air Force tactical forces deployed to Puerto Rico due to the crisis in the Dominican Republic. Airlift assault units were also staged through Ramey to San Isidro airfield near Santo Domingo. Maj. Gen. Marvin L. McNickle headed an Air Task Force for “Power Pack,” as the operation was named. Forces included the 313th, 314th, 317th, 463d, 464th, and 516th Troop Carrier Wings, plus several tactical units – fighters, reconnaissance, and rescue. Several thousand personnel were billeted at Ramey, many in tents. Almost every base unit was involved in support of Power Pack in some manner. The 522d Air Force Band was inactivated on June 1st, and the 72d Food Service Squadron was re-designated the 72d Services Squadron on October lst. Detachment 2, 1608th Air Transport wing, was replaced on January 1st by Detachment 2, 437th Military Airlift Wing (MAC). The base began rehabilitating its 236 Lanham Act housing units during March. On May l5th, ten WB-47 aircraft of the 53d Weather Reconnaissance Squadron began moving to Ramey AFB, and on June 15th, the 53d Weather Reconnaissance Squadron completed its movement to the base. Detachment 2, 53d WRS, was discontinued. On the first of July, Detachment 7, 4th Weather Wing, was activated at Ramey. From August 26-29, all tactical aircraft at Ramey were evacuated to bases in the U.S. when Hurricane Faith threatened. The storm missed the base, and then, from September 29th to October 2nd, all tactical aircraft were again evacuated when Hurricane Inez became a threat. This storm also missed the base. Personnel arrived to man Detachment 7, 4th Weather Wing, on May 3rd. The mission of the two officers and four airmen was to observe solar activity in support of the U.S. space program. On July 2nd, the 72d Combat Defense Squadron was re-designated the 72d Security Police Squadron. President Lyndon B. Johnson and a party of dignitaries visited the base on March 3rd. Work began on a $362,600 annex to the base chapel on September 9th, and on December 6th, approval was received for construction of a new Junior-Senior High School at Ramey. Work began on a new sewage treatment plant on January 13th, at a cost of $943,789. Rehabilitation of Lanham housing area’s electrical system was begun on July 29th, and construction began on the new base high school, also in July. The $3,555,000 contract called for a complex accommodating 1,000 students, grades 7 through 12. On March 1st, the 72d Services Department was inactivated, and personnel assigned to a Services Division in the 72d Combat Support Group, and later, on March 25th, the Naval aerial demonstration team, the Blue Angels, performed at the base. The 72d Wing’s parent unit, the 823d Air Division, was transferred from the Eighth to the Second Air Force on April 1st. On April 29th, the Lanham housing electrical repairs were completed, and on June 30th, the new sewage plant construction was also completed. On July 2nd, the USAF Thunderbirds, aerial demonstration team, performed at Ramey AFB while on their way to South America. On March 10th, the 72d Bombardment Wing learned that it would phase out on June 30, 1971. The wing headquarters and maintenance units, and the 72d Combat Support Group with its units, would also be inactivated on 30 June. The 60th Bombardment Squadron was to transfer at the same time without personnel or equipment to another base, and its aircraft were to be sent to yet another base. The 915th Air Refueling Squadron was to be inactivated and its aircraft divided among several bases. Then, on July 1, control of the base was to pass from Strategic Air Command to Military Airlift Command. On the 30th of June, the 72d Bombardment Wing and its units phased out at Ramey AFB, as ordered. All SAC personnel remaining at the base were absorbed into the newly-activated 4020th Air Base Squadron. MAC assumed control of the base on that same date. Throughout 1972, base deactivation became a reality and the various units readied for closure. Some groups transferred out intact, while others gradually were phased out. Control of the base remained with MAC until early 1973, when all remaining active units were dissolved. The Base was formally closed in 1973. The main installation of Ramey AFB consisted of 3,139.55 acres. In February of 1974, the bulk of Ramey AFB proper (3,138 acres) was declared excess to the GSA In July of 1974, the Air Force transferred 303 acres to the Navy. The Navy still retains title to 46+/- acres. Of the remaining 257 acres, the Navy transferred 57+ acres to the Army, and 129 acres to the Coast Guard. In December 1974, the Air Force transferred 21 acres of land to the Coast Guard, which still utilizes the area. The GSA, in 1978, conveyed to the Puerto Rico Ports Authority, for airport purposes for 30 years, 1,486+/- acres and 309 +/- acres of easements, subject to recapture and converter clauses. The Department of Health Education and Welfare (HEW) by deed date 9 March 1978, conveyed 31+/- acres to the University of Puerto Rico for educational purposes for 30 years, subject to a recapture clause. In February of 1974, HEW by two separate deeds, conveyed 26 and 14 acres to the Commonwealth of Puerto Rico, Department of Education, for educational purposes for 30 years with no recapture clauses. The Department of the Interior, in 1980, conveyed almost 643 acres to the Commonwealth of Puerto Rico for public park purposes in perpetuity. GSA, in 1984, conveyed just over 229 acres for the Department of Housing, Puerto Rico. The deed contained no recapture or reverter clauses. This contained part of the old housing units at Ramey AFB and the Department of Housing has been conveying the individual units to the people of Puerto Rico. Since its deactivation in 1973, Ramey has been through tough times and has come through them intact, with the promise of great times to come. Many stories and news clippings for several years after deactivation, reported on vandalism and neglect involving most of the facilities on the base. Some have not yet recovered, such as the base theater some of the metal and wood hangars, and the hospital. Running roughly along the lines of property disposal stated above, the base is presently owned and operated as an airport and industrial park by numerous public and private agencies. Hangar #5 is now the terminal for Rafael Hernandez Airport and the flight line remains intact and quite similar in appearance to what it was 50 years ago. Many air cargo lines use it on a daily basis. Other passenger airlines, including Pan Am and Continental maintain one daily flight three or more times per week from the mainland at this time (2004). The terminal is in good shape. One is able to select rental cars from Hertz Avis, etc. and can drop into the terminal café for refreshments. There have been constant rumors that multi-million dollar investments will be made to improve Rafael Hernandez Airport and transform it into a major international air hub. Work has begun on the terminal and runways. The U.S. Coast Guard has a major base in Puerto Rico at Ramey. The Puerto Rico Air National Guard and a sizable number of private aircraft are also housed here, and thus, the runway remains quite active. Much of the housing on base has been rehabilitated and, of course, those still included within the rather sizable Coast Guard perimeter, are in excellent shape, and the grounds are absolutely beautiful. A post office is still operated at Ramey Base and the gymnasium and swimming pools continue to be much used. The University of Puerto Rico conducts a branch at Ramey and the secondary school is an absolute thing of beauty. The golf club continues to serve an avid group of enthusiasts and the view from the pro shop deck is second to none. Many changes have occurred over the years, and changes will continue in the future. But for those who served in the U.S. Air Force at Ramey, the major structures are all still intact and the memories of the control tower, B-17′s and the giant B-36′s are all as visible today as they were “way back then.” Time, of course, can never change that.